Copyright: The Artist grants permission for the accepted images to be used by the Gallery in a color art card invitation catalog, website or other promotional use of the Exhibition before, during, and after the Exhibition, with full copyright for artist’s work remaining with the Artist. Entry fee: From $25 for up to 2 images for one category. $5 each additional image. 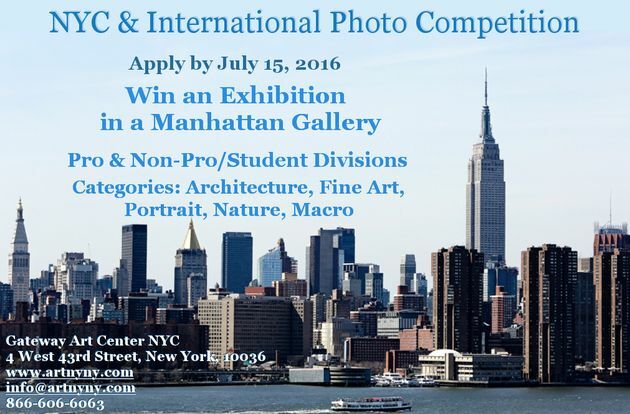 Best Professional and Non-Professional Awards (each) – Chosen from among the 1st prize winners in each of the Categories and awarded a Solo Exhibit of up to 20 photographs in one of the Manhattan Galleries for 5 days. A Group Exhibit for 5 days will be held in one of the Manhattan Galleries. Maximum framed size to exhibit it 24×30 inches (either orientation).